State Capitols are really fascinating. To be honest, I never really planned to visit them, but then, during my visit to Salt Lake City in 2009, I found myself with some spare time to kill. So I decided to see the state capitol of Utah. From the outside it looked like most of the capitols do, a dome, some columns, resembling a Roman or Greek temple. However what really surprised me was the interior. The décor had much in common with the art of eastern European socrealizm, with its muscular sculptures and paintings of workers and farmers. For example there was painting showing happy workers building the first ski jumping hill in Utah. Or how about sculptures with the names like “Immigration & Settlement” or “Science & Technology” Isn’t that cool? These sort of sculptures wouldn’t be out of place in the Polish Communist Party headquarters. I joined tour led by a enthusiastic capitol guide who filled us with numerous facts, trivia and stories about the building and its history. Of course I forgot most of what she said apart from the story about the seismic retrofitting which they did few years ago. What can I say, I’m a bit of a geek. The next capitol I visited was the Oregon State Capitol in Salem. It was during the same trip but this time it was much more conscious decision to go there specifically to see it. It actually doesn’t look like a classic capitol building at all. There is no dome, no pillars, and the whole building resembles some strange Hindu temple or giant wedding cake. The reason for that is that it was built in the Art Deco style in 1938, after previous capitol (with the dome) burned down in 1935. Its shape and the white marble exterior of the modern structure really do make it look like a giant wedding cake. On the top of the cake, I mean the rotunda, there is a 5 meter statue of The Oregon Pioneer. He is holding an axe, (which makes him look more like a lumberjack if you ask me) and is covered with real gold, so looks especially splendid on a sunny day. The interior offered similar mix of the settlers themes like in the Utah capitol. There is for example a mural of the Lewis & Clark expedition as well as rather bizarre one of the first women who crossed continent by the covered wagon. One of the best moments of my visit was climbing to the top of the rotunda, right to the base of the statue of the pioneer, as it offers excellent views of Salem. I had to wait for over a year to see another capitol. This time it was the North Dakota one in Bismarck which happened to be convenient place to stop and break the journey from Minneapolis to the badlands of the Theodore Rosevelt National Park. There are many similarities with the Oregon capitol. The North Dakota Capitol, completed just 4 years before the Oregon one, was also build in the Art Deco style after previous building burned down, and it also doesn’t look like a classic capitol. The nineteen storeys tall skyscraper has very little external decoration, partly due to the fact it was built during the great depression and some of the planned features were abandoned, and partly due to the minimalistic design. Because there is little decoration you can easily spot interesting details like for example the small statues of farmers and workers above the revolving doors. I definitely like it that way. It is simple and clean from the outside as well as inside. Especially the legislative hall, which is tall and narrow, with dark wooden panels on the walls, giving it an impressive interior. I visited it on Sunday and there was no one to check my bag, no one asking questions, not a single person in sight. I was surprised it was open at all. The whole building was totally deserted which make the whole experience a bit like visiting some ancient temple or abandoned space station. Really, really cool. A few days later I drove into downtown Lincoln, to visit probably one of the strangest capitols I have seen so far. Here for change I saw plenty of people, the whole place was buzzing. Before I even entered the building, a charming old gentleman approached me and introduced himself as one of the state senators (even if the Nebraska legislature is unicameral). I have to admit it was the first lawmaker I met in my life. He was very friendly and strongly recommended a visit to the capitol tower. And that’s what I did. Views from the top are quite nice and make you realize how flat and featureless this part of Nebraska is. Don’t take me wrong dear readers, particularly good folks from Lincoln, it’s a nice, quiet and green town, but I probably wouldn’t even stop there if not for the capitol, as by then I had started developing kind of passion for them. Now onto the building itself, which is a strange mix of styles and themes. Built between 1922 and 1932, like a medieval cathedral on the plan of cross, it resembles in parts a Greek (or Roman or Babylonian or even Egyptian) temple. Sculptures of Hammurabi, Moses, Solon, Solomon, Socrates, Julius Caesar and other famous ancient blokes only add to that feel. Then there is 15 storeys tower which could look like one of the NYC skyscrapers but they are not usually topped by a blue and golden dome with the statue on top. Yes, yet another five meter statue. Oregon has its pioneer; Nebraska has “The Sower”. He is, rather bizarrely, based on an Egyptian farmer. Interior has much more design connected to the Native American art and culture than any previous capitol. For example the balustrade flanking the main stairway is ornamented with bison and inscribed with American Indian poems. It is definitely an interesting building, well worth a visit if you are somewhere around central Nebraska. Another capitol with a clear connection to Native American art and design is the one of the state of New Mexico. Finished in 1966, it is one of the newest state legislature buildings and was designed to resemble the Zia Sun Symbol when viewed from above. I have to admit, I was seriously unimpressed by the whole complex. The best aspect of it was actually the free parking in close walking distance to the Santa Fe historic plaza. The building itself, the only round capitol in the nation, is quite boring on the outside as well as inside. It hosts apparently great modern art collection but I’m not really into these sort of things. I the missed impressive murals of pioneers and explorers or sculptures resembling those in ancient temples, which are plentiful in the older capitol buildings. So, after all the capitols without domes (or with small ones like in Nebraska) the Iowa State Capitol in Des Moines was a journey back to the tried and tested design. It has an impressive and shiny dome which is visible from miles around as the building is located on a hill dominating the downtown. It actually has five domes in total, a real treat for the domes aficionados. The central one, covered with pure 23-karat gold, is 275 feet (84m) tall and really is a great sight. The exterior of the building, (finished in 1886), is entirely made of stone with elaborate columns and handsomely designed cornices and capitals. Inside it is one of the most heavily decorated buildings I have visited in recent years, with plenty of murals, paintings and sculptures. Twenty nine types of marble were used during its construction, along with plenty of wood. One room you definitely shouldn’t miss is the Iowa State Library featuring four ornamental balconies with spiralled, wrought-iron railings and circular staircases at each end. Its look wouldn’t be out of place somewhere in the old colleges of Oxford or Cambridge. An absolutely fantastic place. As usual, there are monuments scattered around the capitol grounds. One particularly worth a closer look is the Soldiers’ and Sailors’ Monument, built in 1896 to commemorate those who fought the Civil War. Now, time for two of my favourites. First, the Wisconsin State Capitol. Only three feet shorter than the National Capitol in Washington DC it was completed in 1917 and is fifth home for the Wisconsin lawmakers. The exterior stone is white granite from Vermont, making the exterior dome the largest granite dome in the world, and the four wings of the building face the four diagonal streets of the City of Madison. Its interior is richly decorated with paintings, mosaics and sculptures. I especially liked the four mosaics, high on the rotunda walls, representing; Legislation, Government, Justice and Liberty. They are all designed to look seriously ancient and could be easily fitted into the ruins of Pompeii. The fun part of my visit was getting into the observation deck, which involved a lift ride, 23 marble stairs and, the best of all, a metal spiral staircase. All of this leading into an absolutely fantastic view over Madison. The Wisconsin State Capitol is located in the heart of downtown on an isthmus formed by Lake Mendota to the north and Lake Monona to the south. From the top you can see how great location it is. Unfortunately, the coming storm made my visit on the viewing platform rather short. Damn health & safety regulations. 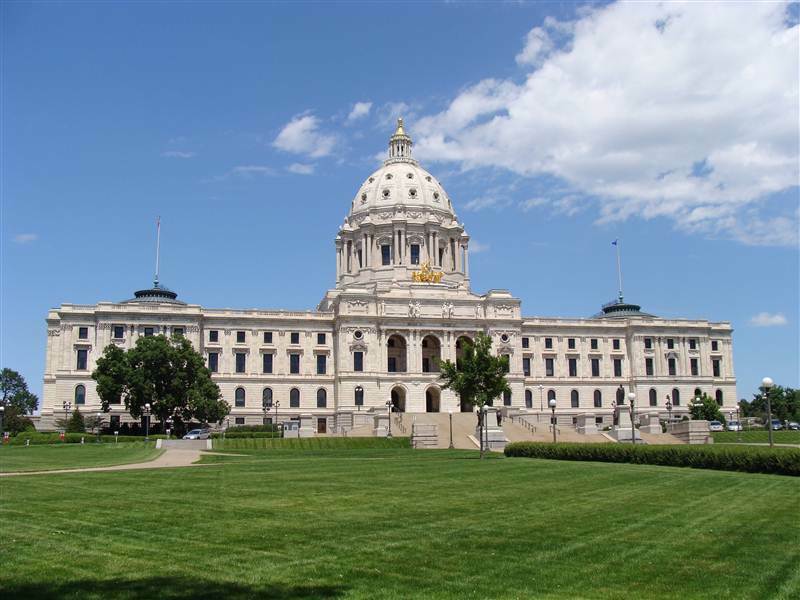 My second favourite is the Minnesota State Capitol in Saint Paul. Built in 1905 it was apparently modelled after the Saint Peter’s Basilica in Rome and is topped by the second largest unsupported marble dome in the world. The first one is on top of the Saint Peter’s Basilica itself, if you didn’t know. Apart from the dome the most impressive feature of the building is the gilded quadriga above the southern entrance. I strongly recommend joining a guide led tour of the capitol building as it is the only way of getting up close to the quadriga. The four horses represent the power of nature: earth, wind, fire and water. The women riding in the back of the chariot symbolize civilization while the man standing at the front of the chariot represents prosperity. 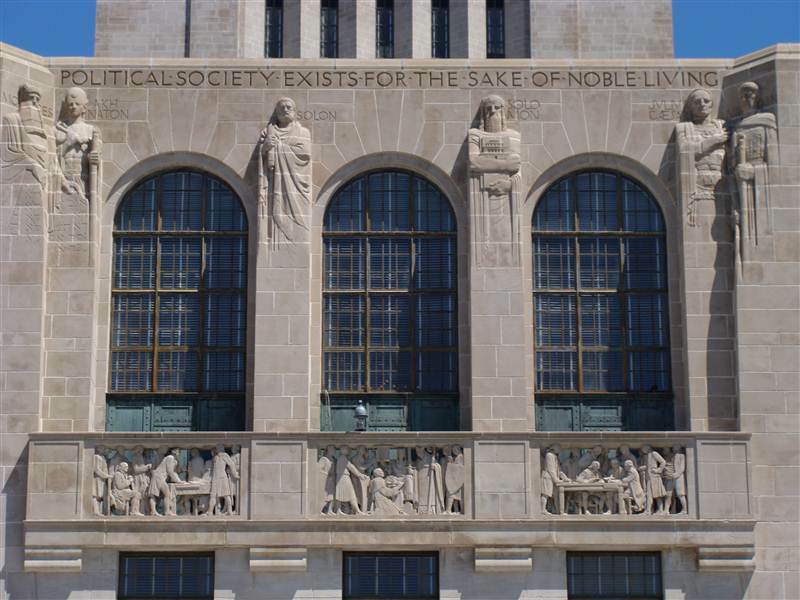 I love all the symbolism in state capitols. Apart from getting close to the quadriga during the tour you will have great views over downtown Saint Paul and as far as downtown Minneapolis with its quite substantial skyscrapers. 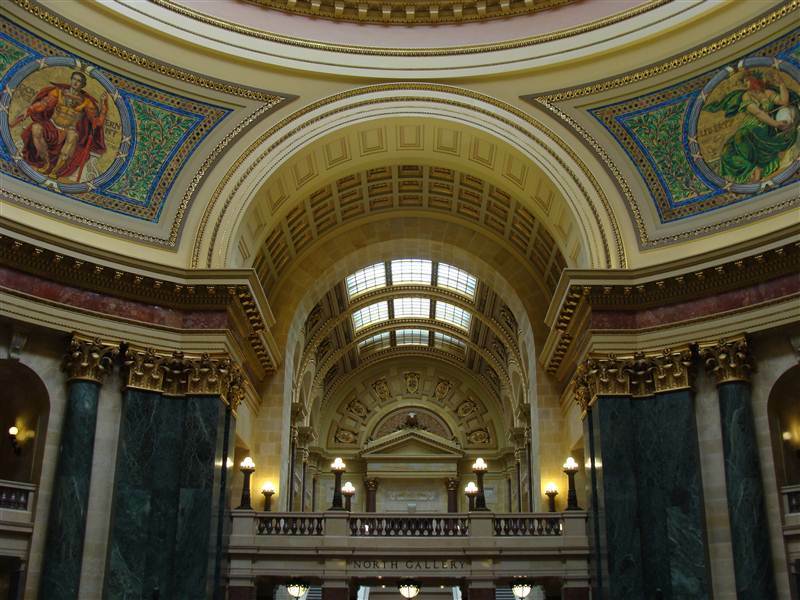 Interior offers the usual mix of allegoric paintings, sculptures and mosaics, including a large star, symbolizing Minnesota’s motto, “The Star of the North”, which is located directly beneath the dome. The Minnesota capitol is truly amazing building, especially on a glorious sunny day. During my last visit in the states I added three more capitols to my list. Unfortunately none of them are as interesting as those mentioned above. The Arkansas State Capitol in Little Rock is a neo-classical building which from the outside is so similar to the National Capitol it was used by film crews as a replacement. The Kansas State Capitol in Topeka has dome taller than capitol in Washington DC but unfortunately, during my visit, the dome was closed to visitors because of renovation, which seriously spoiled my time in Topeka. Finally the Oklahoma State Capitol in Oklahoma City is the only capitol with an active oil well on its grounds. Interestingly it was finished in 1919 but the dome was added only in 2002. Inside you can see some very interesting murals depicting the early history of Oklahoma territory and state. I can’t really explain why I keep visiting state capitols. I guess I like all the strange symbolism and allegories so plentiful in the paintings, sculptures and mosaics as well as the architecture of the buildings themselves. With all the domes, towers, columns, made of granite or marbles they are usually great sights. I also like the fact they are little visited with no crowds whatsoever. I love wondering by myself in large interesting buildings. I have to say I’m seriously surprised how much freedom one has once inside. No one bothers you and it’s possible to peep in into most of the offices. It’s unbelievable in these tense times. So I guess I’ll keep visiting them whenever I’m close to some state capital. I think, I can even change my route just to get to one if it’s not to far. Of course I don’t expect anyone to follow my crazy steps but if you are close to some state capitol please spare some time for a visit. You might be positively surprised. This entry was posted in Uncategorized and tagged Arkansas State Capitol, Bismarck, capitol, Des Moines, dome, Iowa State Capitol, Kansas State Capitol, Lincoln, Madison, Minnesota State Capitol, Nebraska State Capitol, North Dakota State Capitol, Oklahoma State Capitol, Oregon State Capitol, Saint Paul, Salem, Salt Lake City, state capitol, Utah State Capitol, Wisconsin State Capitol on August 24, 2011 by admin.